Well, yes. There’s one thing. Apologies to those who know this, since this is not in any way a new or innovative technique, but you can double a part played on a six-string guitar with the same part played on a guitar in Nashville tuning. Nashville tuning is when you take the four octave strings from a twelve-string (the low E, A, D and G) and put them on a regular six-string guitar. That means the D and G strings will be higher in pitch than the B and E strings, leaving you with a guitar that sounds jangly indeed. If you can tightly double the original six-string part on a recording, it will sound very like a twelve-string. D’Addario and Martin do a ‘high-strung/Nashville tuning’ set (10-27 and 10-25 respectively), and possibly other manufacturers do too. You don’t need to present Nashville-tuned parts in this way, though. Try panning the two parts left and right to create a stereo version of the effect. 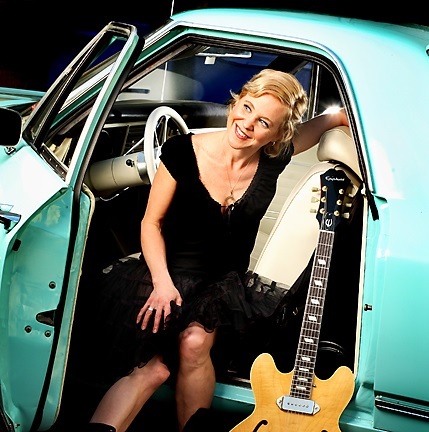 To hear examples of both techniques, have a listen to Hips and Makers and Strange Angels, the first two solo albums by Throwing Muses/50 Foot Wave singer/guitarist Kristin Hersh. Examples of Nashville-tuning parts are numerous on Strange Angels; you’ll have to hunt harder for them on Hips and Makers but they’re there (on Velvet Days and Teeth, at least, I think). You can also hear Nashville tuning on on many, many country records. Where’d you think the name came from? Kristin Hersh, 2006 (Dina Douglass). Guitar probably not in Nashville tuning. This entry was posted in Gear, Music and tagged 50 Foot Wave, acoustic guitar, country music, Hips and Makers, Kristin Hersh, Nashville tuning, sound recording, Strange Angels, Throwing Muses, twelve-string guitar on May 13, 2013 by rossjpalmer.